At the beginning of the week (9/27), Bruce Bartlett forwarded me a link to a remarkable document, entitled “Scoring the Trump Economic Plan: Trade, Regulatory, & Energy Policy Impacts” (strangely, dated 9/29), coauthored by Peter Navarro* and Wilbur Ross. I’m way behind the curve, and there have been numerous examinations of the document, so I will not discuss the entire paper. Rather I’ll focus on the following specific question: would renegotiating trade agreements and slapping tariffs on China, conjoined with the Trump fiscal policy, induce a drastic change employment and trade flows? The short answer — yes, but probably in a direction opposite of that posited by the authors. There are (at least) two views of Donald Trump’s threats to impose sanctions on Mexico and China. The first is as a negotiating tactic, which will wrest concessions from these parties so that in the end, tariffs will not be imposed. The second is that these are real threats that will be carried out in a Trump presidency. I’ll take the second as given (since the US would not in my opinion have much basis for argument under the terms of the WTO). If the 45% tariffs are imposed on China (presumably, as the Trump campaign website indicates, based on assertions of ongoing currency manipulation to undervalue the yuan, a dubious assertion), the most likely outcome is retaliation by China, of some sort. Hence, any sort of gain in jobs in import-competing industries would be mitigated by losses in exporting industries. In addition, it is likely that such sanctions would induce migration of production away from China and toward other East Asian countries where labor costs are still low (in other words, it would accelerate a process already underway). [For discussion of this single policy measure, see here] That means the impact on the overall US trade deficit with the rest of the world would be relatively small, and hence the impact on manufacturing jobs in the US would be small (or depending on the extent and nature of the retaliation, negative). There are two important economic factors to remember when discussing this general issue of manufacturing. First, a lot of trade today is not in final goods, but rather intermediates. The canonical example is the i-phone; there is lots of US-China trade in the final products, but the value added actually comes from all over East Asia (and the US) [see this post, this paper], so a heavy tariff on Chinese goods would not address the basic problem that the relevant labor costs are much lower abroad. Second, labor productivity in manufacturing has grown rapidly since the passage of NAFTA and the granting of PNTR to China, and so even if production comes back to the United States (as some has already), jobs would not necessarily. Finally, it is unrealistic to think that other factors will remain unchanged. The partial equilibrium/elasticities approach to trade balances implicitly holds the trade balance…balanced. Or at least the trade deficit fixed. That partial equilibrium approach is, I think, unrealistic. The current account (CA) is approximately the trade balance (or net exports) for the US. FA is financial capital flows. ORT is official reserve transactions. For the United States on a full float, ORT can be thought of as zero. Then to a first approximation CA and FA must be of equal and offsetting magnitudes. Which account drives the other depends on the model? Most macroeconomists (of most flavors, be it Keynesian, Classical, Humean) would likely place primary importance at business cycle frequencies on macro factors. If the full Trump agenda is implemented, the likely outcome is (1) an elevated government budget deficit which would tend to offset other contractionary effects of policies, and thereby supporting imports, (2) strengthen the dollar thereby further increasing imports and diminishing US exports to the rest of the world. Figure 1 depicts dollar/net export correlations. 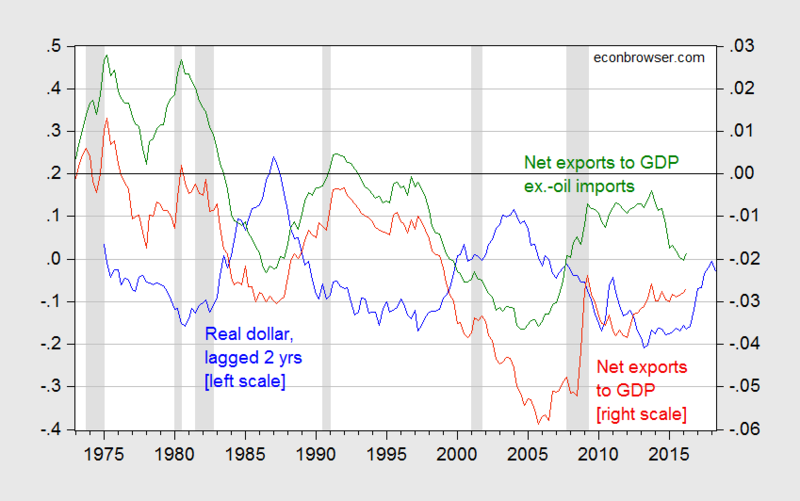 Figure 1: Log real value of US dollar lagged two years (blue, left scale), and net exports to GDP (red, right scale), and net exports to GDP ex.-oil imports (green, right scale). NBER defined recession dates shaded gray. Source: Federal Reserve, BEA (2016Q2 2nd release), NBER, and author’s calculations. Of course, it is conceivable that Mexico and China would roll over and just accept wholesale renegotiation of the conditions under which China accession to the WTO occurred (in the latter case), and NAFTA (in the former). Alternatively, as has been pointed out, withdrawal from NAFTA could be relatively easily implemented without retaliation, but I do not see how this would have a noticeable impact on manufacturing employment, on its own. Quantitative analysis of partial implementation of the overall Trump agenda, discussed here. Source: Daan Struyven, “The Economics of Higher Tariffs,” US Economics Analyst (Goldman Sachs Macro Economics Research, 30 September 2016) [not online]. Update, 10/3: I see that Mr. Trump has long been working hard to support the US manufacturing base, by purchasing Chinese made steel and aluminum instead of US produced materials. Of Trump’s last three construction projects, the first to use Chinese steel was Trump International Hotel Las Vegas, which opened in 2008. Another recent Trump building that has used metal from China is Trump International Hotel and Tower in Chicago, which opened in 2009. This entry was posted on October 1, 2016 by Menzie Chinn. Trump is going to make America great .. again, just don’t ask what he will do to it in the mean time. Menzie, this is bad. Did you see Endnote #5.
rtd: Agreed – that is a pretty egregious error; I assume their proofreader was AWOL. This all presumes an adult would be president. One of the most embarrassing parts is that Peter Navarro, business professor at UC Irvine and graduate of Harvard equates a value added tax to a tariff. Not even the most naive econ 101 student would make this ridiculous mistake. The value added tax is the equivalent of a sales tax and not much higher than the sales taxes paid in many U.S states. This is just a horribly embarrassing report from an academic. All this quibble over when the tax is applied and collected. 1) Entry into the country or 2) At sale within the country. The difference is who pays, us or them. Typical progressives want “US” to pay because it’s more fair/(fill in your own excuse here)? Sheesh! HRC: “Well, let’s start with this: It’s true that too often, past trade deals have been sold to the American people with rosy scenarios that did not pan out. Those promises now ring hollow in many communities across Michigan and our country that have seen factories close and jobs disappear. HRC: “As Secretary of State, I fought hard for American businesses to get a fair shot around the world and to stop underhanded trading practices like currency manipulation and the theft of intellectual property. So, on Thursday, Hillary Clinton made all the same points that Trump has been making. She wants to bring manufacturing back to the US. She is opposed to the TPP. Any trade deal must be rejected if it kills jobs or hold down wages. She will stop practices such as currency manipulation. And if countries break the rules, she will impose retaliatory tariffs. Clinton is even tougher than Trump, promising to appoint a “chief trade prosecutor” and to triple the number of enforcement agents. Menzie, I asked you in the previous thread whether you agreed with candidate Obama that NAFTA cost the US 1 million jobs. Of course, you declined to answer because you want to go on pretending that Trump’s views are somehow unique and not shared by Democrats. Now I’ll ask again: shouldn’t this post be titled “On reading the Trump and Clinton economic plan?” Don’t the same criticisms you are making in this post apply to Hillary Clinton? Rick Stryker: I don’t recall Secretary Clinton advocating withdrawal from various PTAs, including NAFTA. I don’t recall her advocating imposing tariffs on China “on day one” (even before the SecTreas could be confirmed). And I might mention that where the yuan stood in real effective terms in mid-2008 differs substantially from where it stands today. Your argument seems to be that because Trump sometimes talks tougher that means there is a fundamental distinction between the two. Sometimes. But it was Clinton who is talking more toughly on the “trade prosecutor.” Trump didn’t advocate withdrawal from NAFTA. He advocated re-negotiation while putting withdrawal on the table if there is a refusal to re-negotiate. Tough talk from politicians doesn’t mean a whole lot. Bush said “Read my lips. No new taxes” and we all know what happened. Candidate Hillary Clinton, candidate Barack Obama, and candidate Donald Trump all have essentially the same position on NAFTA. But you want to pretend otherwise by making these jesuitical distinctions. Rick Stryker You’re missing an important distinction. It’s not an economic sin to express doubts about NAFTA or TPP. Those trade agreements are first and foremost policy issues that require judgments concerning the distributions of gains and losses. The pure economics will only tell you whether or not there will be an increase in GDP; it won’t tell you how that increase gets distributed. If a trade deal makes the wealthy very much better off while making the poor worse off, then a candidate may very well want to oppose a trade deal. Reasonable people can disagree about the best policy option. But that’s not what’s at issue here. The issue in Menzie’s post was about the mechanics of Trump’s understanding of how economics works. For example, people can have policy disagreements about the minimum wage while agreeing that demand curves are generally downward sloping. In this case Trump is misunderstanding the basic mechanics of how international economics works. It would be like saying that demand curves are generally upward sloping. Trump made a similar blunder regarding VATs…or rather, his “economic” advisors made a similar blunder. What does that tell you about the kind of talent you’re likely to find in a Trump administration? Definitely recruiting from the “Single A” minors. Don’t you realize how ridiculous you sound? Hillary and Obama are wrong on trade, but Trump is even more wrong, since even though he has the same wrong views, he understands the subject less well? That’s seriously what you’ve resorted to? You seem to be desperately looking for a way out but there is no way out. Trump has adopted the same position on trade that Democratic candidates typically adopt. You can’t attack Trump on this without also attacking the candidates you support. Rick Stryker: I still don’t see where candidate Obama stated anywhere “let’s renegotiate and if we don’t get what we want, leave, existing preferential trading arrangements”. That is substantively different from bewailing existing agreements. I don’t agree with the 1 million estimate, which seemingly comes from EPI. If you are trying to say Mr. Trump’s and Secretary Clinton’s views on the impact of trade on the economy are the same, I would say, just listen to the difference in proposed remedies. Even Senator Sanders’ proposed remedies were not as extreme as Mr. Trump’s. I do agree, however, with Mr. Trump’s statements that the tax system is biased toward giving high income earners breaks, especially those who leverage. Although he has not stated as such, I also believe it is biased toward giving land developers particularly generous breaks. Menzie’s campaign of selective analysis is a common tactic of Democratic economists. Paul Krugman is his recent column VAT of Deplorables takes Trump and his advisors to task for arguing that a VAT tax is an unfair trade policy. Occasionally, Krugman is correct and this is one such occasion. Trump believes that common fallacy about the VAT. Are we then to conclude that Trump is too ignorant to be President? What Krugman conceals from his gullible readers though is that same fallacy is believed by prominent Democratic leaders that he would not argue are too ignorant to be President. Former President Bill Clinton, who most Democrats would argue was a highly successful president, shares the VAT fallacy with Donald Trump. In 2010, Bill Clinton argued to Maria Bartiromo in an interview on CNBC that countries that have a VAT have a competitive advantage and that the US should institute a VAT to get a competitive advantage for itself. Many conservatives do not want to support Trump because they are alarmed by some of his economic policies, many of which are shared by Democrats. Left wing economists are exploiting this discomfort by attacking Trump correctly on these fallacies while concealing that these fallacies are shared by Democrats. Conservatives have to ask themselves whether they should withhold support from Trump because he holds some economic fallacies that are shared by Democrats when the alternative is implementation of the full set of economic fallacies. Should conservatives let the best be the enemy of the good? Rick Stryker Nice try, but not very convincing. And here’s why it isn’t convincing. Twenty years ago President Bill Clinton nominated a guy name Larry Meyer to the Federal Reserve. Some time after Meyer left the Fed he wrote that when he first met Clinton at the WH he was underwhelmed with Clinton’s understanding of macroeconomics. But yet most people would argue that the Clinton years were pretty good. Surely one reason is that Clinton had a nose for talent. He was also intellectually curious. And he was confident and smart enough to listen to top flight macroeconomists. I think the same can be said about Obama. Like most lawyers, candidate Obama’s understanding of macro 101 was just short of dismal. He said a lot of dumb things about economics. He also said a lot of dumb things about healthcare, such as believing you could have universal coverage without a mandate. But both Obama and Bill Clinton were very different from Donald Trump in at least one very important way. Both Obama and Clinton were willing to listen to folks who were smarter than they were on important issues. I doubt that even Trump’s most ardent supporters would claim that a President Trump would admit to himself that he was wrong about an issue and defer to more knowledgeable advisors. And if you believe that Trump would defer to others, then I’ve got some swamp land in Florida I’d like to sell you. When people talk about Trump being tempermentally unfit for the presidency, this is what they mean. It’s not just his middle school locker room mouth or frat boy attitude. It’s his unwillingness to even want to engage in serious thinking about issues. It’s his used car dealer attitude…”What’s it gonna take to get you behind the wheel of his car?” In TrumpLand everything is negotiable. There is not even the slightest interest in understanding issues in order to improve people’s lives. It’s all about finding some sheep to be shorn and then moving on to the next deal. All Presidents come to the job ignorant about most things that they’ll have to encounter on the job. As far as I know there hasn’t been a single President that could pass an econ 101 class prior to taking the oath of office. The question is whether or not you can imagine a presidential candidate with the intellectual curiosity, intelligence and self-confidence to admit that he or she might not know it all. Good luck trying to convince us that Trump succeeds in any one of those tests. Bill Clinton and Obama clearly did. Whatever else you might say about Hillary Clinton, no one ever accused her of not being smart or intellectually curious or self-confident enough to listen to experts. She’s also a workaholic, which is something that Mr Trump clearly is not. Even his lawyer admitted that Trump spends most of his time in his Trump Tower office taking naps and watching television. I guess that’s one way to lose almost a billion dollars and still believe yourself a genius. The problem with Trump’s VAT nonsense isn’t just that a presidential candidate said something stupid. That’s a dog bites man story. The problem is that this nonsense was written by people that he apparently considers knowledgeable about economics. Posted this yesterday but it never appeared. This is happening a lot. Trying again. Ok, so your argument is that Hillary Clinton will have the good judgment to have much better economic advisers than Trump and will listen to them but Trump will have poor advisers and not listen to them. As usual when you comment 2slugs, we have entered a fact-free zone. Hillary Clinton’s long standing economic adviser is Gene Sperling, who Obama also appointed to be director of the National Economic Council. Sperling is not an economist but rather a lawyer. He has an undergrad degree in political science and JD. He also has an MBA. The MBA is the extent of his economics training, which isn’t much. I don’t expect he’ll be able to advise Hillary very much on economic fallacies given his background. One of Trump’s chief economic advisors is Steven Moore, chief economist of the Heritage Foundation. Moore has at least some training in economics, unlike Sperling, having earned an MA in economics. Moore advised Trump to revise his tax cut plan and Trump listened to this advice and did so, contrary to your claim. But Moore also will be challenged advising Trump on economic fallacies. Again, there is no real difference between Hillary Clinton and Trump on this dimension. If Hillary wins, she’ll also appoint academic economists. So will Trump. So what? Rick Stryker Steven Moore is a laughingstock. Jared Bernstein isn’t a PhD economist either, but he seems to have dispensed some pretty good economic advice. We know the kinds of economic advisors that Trump would select. They would be fat cat business types who think running a government is just like running a business. The only academic economist on Team Trump is, quite frankly, a flake. Apparently he’s the one responsible for all of that VAT nonsense. We also know the kinds of economic advisors that Clinton would select. Probably a fair number of Bill Clinton retreads like Larry Summers; but that’s okay. But we can be pretty sure that most of them would come from academia, not the ironically named “Club for Growth.” We can also be fairly sure that she would be able to follow the discussions, unlike Trump who would be channel surfing and spacing off. Assuming that a new tariff will lead to expanded US production to displace imports is a very heroic assumption. The reason that the US does not manufacture more at current exchange rates and prices is that it is not profitable for them to do so. So for years the US ability to manufacture many consumer goods now imported has faded away. So the US will be unable to displace many more expensive imports in the short run because the US no longer has that industrial capacity. Maybe after a few years that capital could be built and the necessary labor trained, but at best it will be a long slow process. Consequently, I have to conclude that in the present environment high tariffs would just generate higher prices for imported goods and higher inflation domestically. The combination will cause consumers real income to fall. Somebody tell me what is wrong with this analysis. Quite aside from the Rick Stryker’s fantasy that Trump has not called for simply eliminating NAFTA, one of the bigger problems with this incompetent statement apparently mostly due to Navarro, is this idea that they are going to very easily just get rid of the US trade deficit. It is not laid out how this will be done. Mostly it is implied that this will come from cutting way back on imports from China, Mexico, Japan, wherever. However, any real effort to do that will certainly involve the US violating various treaty agreements and rules, and will almost certainly result in a retaliation in which some or all of these nations make efforts to cut back our exports to them, a world trade war. Highly unlikely this stupid exercise will succeed in eliminating the US trade deficit. The other way to go would be some massive devaluation of the dollar, although again, other nations have the capability to resist this. Again, not at all obvious how to pull this fantasyland stuff off. I’m so old I can remember when Rick Stryker got all huffy and denied that Scott Walker would ever have economic advisors as stupid as Stephen Moore and Lawrence Kudlow. Now he is bragging about the fact that Trump has those same two idiots as his chief economic advisors. Rick, Rick, Rick. Always good for a laugh. You’ve missed the point, as always. I’m obviously not bragging that Trump’s advisors are good. I’m arguing against the idea that anyone should support Clinton because her advisors will be better, as suggested by 2slugs. They won’t be better and aren’t better. Well, let me jog your memory. Step into the Wayback Machine with me and let’s turn the dial back to February 2008, to the night of the debate between Clinton and Obama in Cleveland. Tim Russert asked some pertinent questions. Let’s listen in on the question to Hillary first. Now let’s listen in on Russert’s question to Obama. MR. RUSSERT: Senator Obama, you did in 2004 talk to farmers and suggest that NAFTA had been helpful. The Associated Press today ran a story about NAFTA, saying that you have been consistently ambivalent towards the issue. Simple question: Will you, as president, say to Canada and Mexico, “This has not worked for us; we are out”? SEN. OBAMA: I will make sure that we renegotiate, in the same way that Senator Clinton talked about. And I think actually Senator Clinton’s answer on this one is right. I think we should use the hammer of a potential opt-out as leverage to ensure that we actually get labor and environmental standards that are enforced. And that is not what has been happening so far. What Clinton and Obama said is exactly Trump’s position today. Let’s compare to what Trump said in his speech on trade. Article 2205 allows withdrawal from NAFTA in 6 months with notice, which was precisely the question that Russert put to both Clinton and Obama. Menzie, there is no real difference between candidate Trump’s, candidate Hillary’s, and candidate Obama’s position on NAFTA or trade in general. Every word you right against Trump on this topic applies equally to candidates Hillary Clinton and Obama. On day one of the Trump administration the U.S. Treasury Department will designate China as a currency manipulator. This will begin a process that imposes appropriate countervailing duties on artificially cheap Chinese products, defends U.S. manufacturers and workers, and revitalizes job growth in America. We must stand up to China’s blackmail and reject corporate America’s manipulation of our politicians. The U.S. Treasury’s designation of China as a currency manipulator will force China to the negotiating table and open the door to a fair – and far better – trading relationship. You seem to think that Trump’s promise on his website somehow distinguishes him from Clinton and Obama, as if Trump’s promise will somehow have far-reaching consequences. But Trump’s promise is just symbolic campaign rhetoric that’s happened before. Mitt Romney also promised to designate China a currency manipulator “on day one.” Candidate Obama wrote a stern letter on currency manipulation to Henry Paulson in 2007, accusing the Bush Treasury of refusing to take action. But you are obviously unaware that this threat has actually happened in the past. The last time China was designated a currency manipulator was by a Democratic Administration–Bill Clinton’s Treasury–in 1994. The Omnibus Trade and Competitiveness Act of 1988 requires to the Secretary of the Treasury to periodically examine the FX policy of foreign countries and to assess and report whether they are manipulating the currency to gain an unfair trade advantage. Certain conditions as specified by the act must be satisfied to label a country a currency manipulator. The last time it happened was in 1994. If a country is labeled a currency manipulator, then the act specifies that negotiations must take place. There really aren’t any other consequences. This designation has symbolic meaning but practically doesn’t mean much, since negotiations are generally always ongoing. Rick, you should focus on policy positions in 2016. Taking quotes from 2008 or 2004 and placing them into the context of today is inappropriate when discussing a candidates current policy position, especially if their position has been modified over the preceding 8 to 12 years of experience. Hillary Clinton is saying today–in 2016– that she’d re-negotiate NAFTA, appoint a trade prosecutor, stand up to currency manipulation, and institute targeted, retaliatory tariffs. Of course, what candidates say and what they actually do are two different things. Hillary’s chief economic advisor, Gene Sperling, really doesn’t have those views. But I’m comparing what candidates Trump, Obama, and Clinton say on the subject of trade, and it’s very similar. One reason that many conservatives can’t get on board with Trump is that many of his attitudes and policies are equivalent to what you find on the left wing of the Democratic Party. Trade is an example. Lots of conservatives I know are very uncomfortable with Trump’s stated views on trade just as they were with Obama or are with Hillary when they say the same thing. The debate is whether Trump is like Hillary and Obama, using anti-free trade rhetoric to win the votes of blue collar workers, but then not doing it if he gets elected. Some conservatives are afraid that Trump really does mean it. No one knows for sure I guess–this is politics. one common problem with trump compared to somebody like clinton, is the specificity of the “rhetoric” if you will. so you argue a politician will say something to get a vote, without intending to follow through. and that can work in generalities. but trump has made a habit of stating specifics about a case, such as china currency manipulations. clinton speaks generally about currency manipulators, and not specifically targeting a country in most cases. when the rhetoric becomes specific, you are typically held more accountable for your statements. trump has argued against china for currency manipulations, specifically devaluing the currency for economic gain, when china has been doing the exact opposite. you may call it manipulations, but it is not the devaluation argument trump has promoted-they are trying to strengthen the yuan. it is this type of economic mistake that creates the problems for trump, and raises the question: is he making an (incorrect) economic argument, or is this a dog whistle to rally the anti-china crowd? personally, i don’t think trump is interested in any coherent economic policy. if he were, moore and kudlow would not be advising him on economic policies. i hear dog whistles. You guys are desperately looking for some way to distinguish Clinton’s from Trump’s trade rhetoric. Now you are saying that Trump is more specific, mentioning China by name while Clinton is more circumspect, speaking only generally. As you can see, Hillary Clinton has gotten specific too. You hear dog whistles when Trump does it. Do you hear dog whistles when Clinton does it? hillary states china, japan and other asian countries held down the value of their currencies for years-past tense. this was the case years ago, not today, as trump asserts in present tense. in your final quote, hillary says that china is a currency manipulator. today, they are propping up their currency, which is the exact opposite of devaluing their currency. you could argue they manipulate, as hillary states. if you argue they manipulate by devaluing the currency, you are wrong-the trump position. the details make a difference. rick, either trump is making economic policy decisions based on ignorance. or he is making dog whistles. i am so sorry you cannot understand the difference. If Trump wins, the tough talk may result in more open markets to increase U.S. exports. Isn’t that Trump’s goal?